A Thai curry is not exactly a stir-fry, but more like a stew. For a good beef curry, I would cube some chuck or whatever, add a can of green chiles, a chopped onion, some chopped garlic, some chopped cilantro, 1/4 cup of fish sauce, a Tbsp or two of sugar, and a can of coconut milk. Stew it all together about an hour. For a much hotter sauce, you can use a Tbsp. or two of canned red curry paste. But I can’t stand the heat. For chicken, I would do basically the same thing, but use canned green curry paste. For a mild paste, put the chiles, onion, garlic and cilantro in the blender with a bit of water, and add that to the coconut milk and chicken. Don’t forget the fish sauce…it’s the salt. That was when bought my first fish sauce. I always enjoy looking at the many brands in the store I go to. This photo is of the one I have in my cupboard currently. It’s hard to imagine that the flavor varies much; in any case, it’s not something I want to sample by the teaspoon, or even quarter-teaspoon. Thai curry paste – ½ to 2 T.
fish sauce – ¼ c.
Cook until done. Adjust seasonings. Put some Sticky Rice in a bowl and ladle the stew on top. These are flexible amounts where given. You can make this with chicken, pork, fish, shrimp or tofu. Adjust the cooking times accordingly. You can also use part vegetable, fish or meat stock in place of part of the coconut milk, and use part or all soy sauce in place of the fish sauce. But the Thai curry paste (not expensive if you can find it at a Southeast Asian store), fish sauce and coconut milk make the Thai flavor. I will i nterrupt the string of recipes to talk about the rice. I do have another post in which I discuss the rice component, but just today I showed my housemate Kit how I make it, and that generated some more pictures for me to share. When this stew first became part of my repertoire, I probably served it over sweet brown rice, but eventually I learned how to make the Thai Sticky Rice that really finishes off the exotic meal. I like to form it into balls while it is still warm; some go into bowls with the stew, and some are to serve on the side, for dipping into a mild coconut sauce. One time I had three different brands of coconut milk in my pantry and when I opened them I noticed how different they looked and tasted, so I wrote down my findings; the calories listed below are per can. This week I added to my information card when I discovered the last brand, and now I have two favorites. I found them both at the Thai store, and also at Food Maxx, a dollar more expensive. I know many people will only be able to find the Thai Kitchen brand in supermarkets, but if you can locate an ethnic market to shop at even once a year you can save a lot on all these ingredients. After I wrote down that very flexible recipe above, I had occasion to create a fish stew for a crowd, on a Lenten “fish day.” I’ve done it three times now, and have this “new” recipe on its own card. I needed the stew to not be too spicy, so I switched to Yellow Curry Paste, the main ingredient of which is lemongrass instead of chiles. I like to get these pastes at the Southeast Asian store, where they cost only about $2 each. And whatever other vegetables you may like, however much you like. I have used bok choy, snow peas, sweet potato, butternut squash, mushrooms, sweet red pepper…. And simmer until the fish is opaque, just a couple of minutes. Serve over sticky rice. This is the version of stew that I made yesterday to take to the family with a new baby and sickness in the house. It seemed to me that they might like something different from the usual chicken or lasagna. I made eight quarts, enough to keep half at home. This was the first time I used bok choy; I loved the yams in there, and noticed that the cilantro stems I hadn’t had time to remove had disappeared on their own. When the vegetables were almost done I took out half for us and put that in the fridge, and added pork to their pot. Tonight I heated up our portion and added fish, and made another batch of rice. We made it all into balls, and ladled the stew over three of the rice balls in each bowl. The rice in the bowls quickly gets soft, but you can enjoy a still-chewy rice ball on the side dipped in a sauce. Here is one version; you can experiment and make your own, varying the amounts and seasonings. This sauce can also be spiced up, all or in part, by the addition of extra curry paste. If your stew is mild but some people enjoy more heat, they can add spicy sauce to individual bowls. What could be more traditional than banana bread? Every thrifty cook has her special recipe that makes very good use of the ripe fruit. My old favorite was the Laurel’s Kitchen recipe, because it used the most bananas, and it includes both toasted walnuts and dried apricots – yum! Nowadays I rarely bake this kind of cake, for several reasons, but I still acquire bananas that am loath to toss. Last month I cut a few into chunks and froze them, with hopes that someone someday will want to throw them into a smoothie. But then my Coconut Flour Project loomed. It all started with a humongous bag of coconut flour I bought at Costco, because I love everything coconut and am always trying to cut back on grains. Beyond the flour itself I hadn’t anything to show for my time spent thinking about what to do with what I thought was a great resource. That’s not exactly true: I saw a recipe for coconut flour bread in Pippin’s files, and she warned me that for her it turned out “kind of dry,” but I eventually tried it. It might as well have been made with sawdust. Lesson learned: don’t use the stuff alone. I had given up surfing and searching for coconut flour recipes and instead bought an old fridge to use in my garage, in which to keep my bag of coconut flour and other currently neglected semi-perishables, against some misty future when I would suddenly bake a lot again. THEN Nikkipolani made some banana bread and mentioned it briefly on her blog, and because she said it was grain-free I followed the link to SlimPalate and found a recipe for which I had all the ingredients right here in one refrigerator or another. I even had the cacao nibs, but I didn’t add them, and it doesn’t seem that nikkipolani did either. The crumb of this bread is so moist and tender – nothing dry about it. The banana flavor melts into the subtle almond and coconut, with honey and vanilla. I’d like to try it with the cacao nibs next time. I’m not sure this loaf will have enough opportunity to become the New Traditional, but it is now my favorite banana bread. Update: I bought some bananas for the purpose of making this bread again, which I have now done. I had extra mashed banana so I made a 50% bigger loaf by increasing all the ingredients that much. I used large instead of extra-large eggs this time, so the batter was thicker, but the end result is not much different from the first time, and just as delicious. In the course of telling about various pies over the years, I’ve mentioned this versatile pie crust recipe which can easily be made vegan, and is mixed up right in the pie plate. In the Orthodox Church we have a good many days all throughout the year when we fast from dairy and eggs, those go-to ingredients for many desserts, so I’ve made use of this recipe on special occasions that also happen to be fast days. An example is the pineapple-coconut pie which I mention on a rambling post that offers vague instructions indeed. 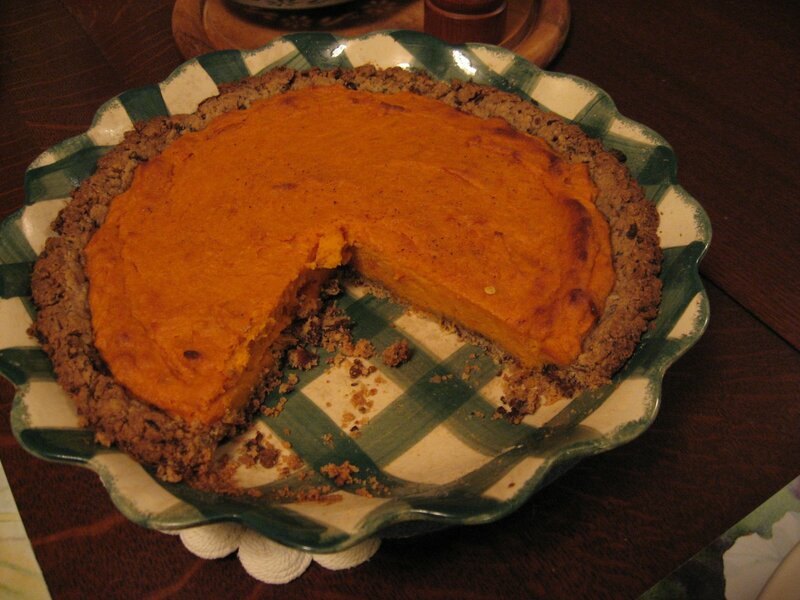 But the crust recipe comes originally from the Amish, who aren’t known for fasting or eating vegan, and it’s a wonderfully quick shell to throw together even for a rich pie, like the colorful first one I ever blogged upon. Since my last detailed pie recipe here, I have acquired a convection oven, and I want you to know that I no longer have to do the foil collar thing to keep my crusts from over-browning. Now it is easier (what?) than ever to whip up a pie, any day of the year. As the Nativity Fast is soon upon us, any pie I make will likely be a vegan one using this recipe, which I am giving in the original Amish version with my notes. Finally, what you’ve all been waiting for… back for a second appearance… TA DA! Place the flour, sugar, and salt in a pie pan and mix with your fingers until blended. In a measuring cup beat the oil and milk with a fork until creamy. Pour liquid all at once over the flour mixture. Mix with the fork until completely moistened. Pat the dough with your fingers, first up the sides of the plate, then across the bottom. Flute the edges. Shell is now ready to be filled. If you are preparing a shell to fill later, or your recipe requires a pre-baked crust, preheat oven to 425°. Prick the surface of the pastry with a fork and bake 15 minutes, checking often, and pricking more if needed.